Current sign-up is vague—what does “stay in the know” actually mean?—and doesn’t tell customer what they’ll get out of it. Specific, compelling language that answers why customers should give up their email, and alleviates their concerns about spam and frequency so they don’t have to wonder. Establishes trust quickly. Currently, product details are hilarious and so fun to read but in giant blocks of text that no one (besides me) will read. Made copy digestible and scannable, with details clearly laid out (so customers know exactly what they’re getting), while preserving CB’s sassy tone. I wrote and designed responsive product details to collapse into an accordion to keep the page simple and reduce overwhelm with progressive disclosure. Shipping isn’t communicated until halfway through checkout. Based on user research, shoppers want and expect to know how much they’ll be paying for shipping upfront. Added a quick line about shipping—that also serves as a motivation to spend a minimum amount to get shipping for free—on the add-to-bag modal. 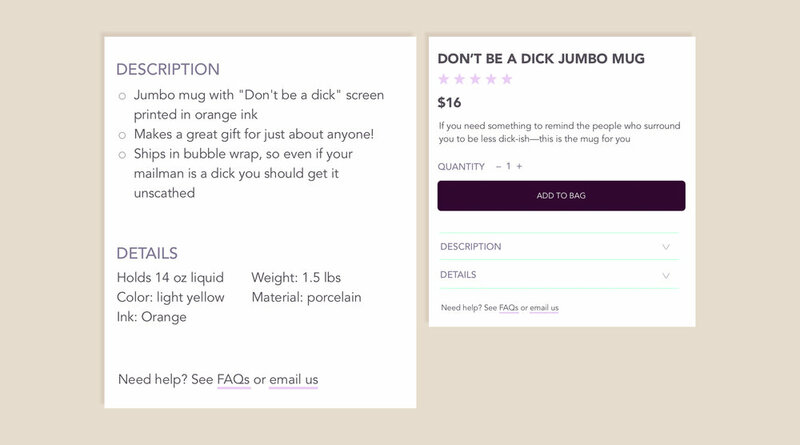 Also added to order summary, which is present through every step of checkout, and gives user a written high-five that they get free shipping, which makes them feel a small sense of accomplishment or delight. After an order is placed, letting the user know next steps is crucial to maintain trust—they just spent money! They want to be assured everything will be taken care of from here on out. Here, I made sure they know they’ll soon be getting an email and also circumvented a dead-end page by linking them back to the Collections page.